Corstorphine have a pleasant easy to get to venue. a well lite room with plenty of space for each player. I have managed to recover 4 score sheets with games I can decipher. First up is board five. I.Ahmed - R.Burns. always moved twice in the opening and Kings never castled. by leaving d4 unprotected it could have cost White a pawn. A few moves later this position arose. White has just played 7.Bf4. and then Black would have to take the b-pawn with the Queen. uncastled King is something I would not recommend to my worst enemy. one up to a missed opportunity by Black. a dodgy looking b-pawn. Well so do I.
me 7...Qb4 and 8...Qxb2 would have been better than 7...e5? So Black's strategy is keep his King in the centre and open the e-file. "Castling is for wimps." declared Bertie Burns when I suggested 6.0-0.
but only when he was faced with losing his Queen or a piece. complete control and not in the mood to chuck it. launches a bayonet attack with his g & h pawns. Once again a King is left uncastled - It's Division III thing. a game he played against Graham Morrison. position with a sac-sac mate combination. 20 minutes later I fetched Alan and confessed I could not see the win. pawns in front of his King. There is no weakness, nothing works." He showed me some of his attacking ideas, I showed him mine. Nothing worked. We pulled the h-pawn one square forward and suddenly everything worked. I never forgot that wee lesson. Pawns in front of a castled must only be moved if forced too. In this game the Black player himself said the bad move was indeed 11...h6. White answered 11...h6 with 12.Bxh6!? game on. of defence's but what would it prove? The sacrifice was unsound? Me proving beyond doubt the sac was unsound does not undo the score. The sacrifice was needless. The damage had been done. All White need to was retreat the Bishop and push the g-pawn. He would have the virtually the same attack this time on level terms. error both players possibly knew would come...came. 15....Kg7?. When the winning combination presented itself White saw it. his King with his pieces but there are too many weaknesses to cover. Queen as she wipes out the Black army. An interesting and entertaining game. is not misjudgment or bad play. It's part of the opening strategy. benefit of personal lessons from Mike Basman the inventor of this opening. A good opening at this level, infact good at any level. 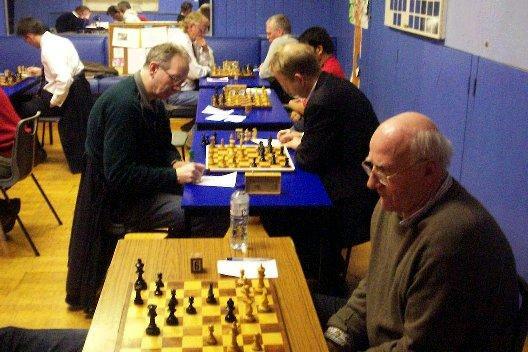 I played it against Pat Coffey in the SNCL and obtained an exciting draw. I use to play it on a fairly regular basis and did quite well with it. But there is a flaw in it. I spoke to Jake after the game and asked what do you play against ....? "That's it" he replied. "What do you play against .....?" No I'm not going to tell you what it ..... is. Find it yourself and learn something about chess. near the idea in the key position. Fritz is a pocket calculator with attitude. playing an opening variation you know to be dodgy. True. But perhaps some of us like the wee buzz we get from rolling the dice. OK I admit it. It's a culpable character defect. Believe me the ...... plan gives White an easy and pleasant game. be defendable for Black but the there are double edged variations. The end comes suddenly. White blundered with 17.Bf4? the game he said he saw this and took en passant. I then kept mating him on f7. Knight on d6 and the undeveloped Black Queenside give him chances. White on the point of resigning. Corstorphine Board 1 was lost before a pawn was pushed. Black saw White's 1900 grade and decided to get out the book A.S.A.P. Now some moves are not in the book because they are bad and 3...Bd6 is bad. I've seen some of Angus Ruthven's games before. He can open a game of chess. I refuse to believe he would have played 3...Bd6? if his opponent had been 1200. Common mistake. I've done it myself. variation you have never played before. I've often heard weaker players say in the post-mortem. I had better try this." and "try this" is usually a blunder. It's exactly what the stronger player was wanting to see (and expecting). Having said that. White should have jumped all over Black's opening. If Black mucks about in King Pawn openings then go for f7. 5.Ng5 wins the exchange and a pawn with best play. If Black wriggles then he gets scudded with a Queen sac. I'm not going to make any excuses for White missing 5.Ng5. It's the best move in the position. waiting for more blunders thus adding fuel to old saying. weak move can turn into a winner." for the end. Meanwhile White struggled to get a working plan going. Suddenly, around about move 17 a new White player appeared at the board. seventh it was all over. 28...Be8? was the big blunder Black knew he was going to play sometime. In his mind he never gave himself a chance. Grades? Forget them and play chess. It started off with a missed shot by White and possibly a quick kill. It ended in a clumsy manner. 29.Re6! would have added a wee bit of class. Nitpicking? No. 29.Re6! was not beyond Eddie's ability. He will be annoyed he missed it. I'm enjoying going around the clubs. I'll be in your neighborhood soon.